Golden-voiced Salt Lake City songstresses Marie Bradshaw, Kiki Sieger and Corinne Gentry have been involved in so many music projects with ties to Utah that it wouldn't hurt to have a Venn diagram handy to keep them all straight. 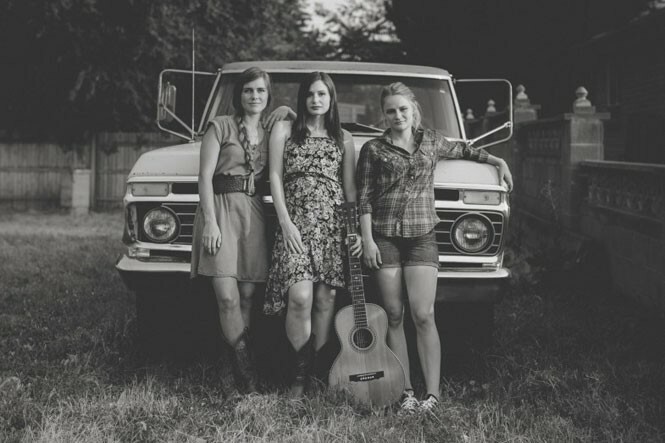 They started out as The Folka Dots; all three recently contributed backup vocals to top-shelf albums by influential singer-songwriters Jay William Henderson and Ryan Tanner; sisters Bradshaw and Sieger front electric Americana/country quartet The Hollering Pines; and the trio are also the three-part voice of Americana/country outfit The Souvenirs. It's an impressive résumé for three musicians who started playing together around 2009 without any plans of being part of an actual band. Back then, they chose a breezy name, The Folka Dots, to reflect the fact that the project wasn't much more than a group of longtime friends getting together to play music for the fun of it. But to their surprise, The Folka Dots—a mostly acoustic five-piece that drew from folk, blues and Americana influences—started to get a following. However, it wasn't long before the band's progression reached a plateau, hindered by the apparent lack of gravity inherent in the sugar-sweet Folka Dots name. "We named our band before we really ever thought that it would be anything more than friends getting together to play cover tunes," Bradshaw says. "We kind of got to the point where we outgrew our name, and we heard from a lot of people that they had overlooked us because of our name. It just didn't sound serious, and people who hadn't heard us didn't take us seriously or give our music a listen because of it." After amicably parting ways with the other two members of The Folka Dots about a year ago, Bradshaw, Sieger and Gentry found themselves with the opportunity to put the focus of their music back on "the basics of the three-part harmonies," Gentry says, as well as reinvent their image. "We felt that if we wanted to be taken seriously and take the band to the next level, we needed a more professional-sounding name," Bradshaw says. So became The Souvenirs, named for the John Prine song "Souvenirs." And the new band was different than The Folka Dots in more ways than the name alone. They'd matured as musicians, and employed a more methodical approach than they had as The Folka Dots. "With The Folka Dots, we were young musicians," Gentry says. "We were so excited that anyone would want to hear anything we were doing, and so we were just taking every single show and loving it." But as The Souvenirs, she says, "We've had some experience, we've done a lot of networking; we're kind of in a different place now." They also patiently waited for the stars to align before heading into the studio to record their debut album, I Ain't Happy Yet, released Aug. 30. "We wanted to record for a long time, and we never got around to it because we just wanted to find the right place to record and make sure that everything was perfect," Bradshaw says. The ideal situation finally presented itself when Tanner invited The Souvenirs to Nashville, Tenn., to record at the legendary Sound Emporium Studios, the birthplace of records by icons including Johnny Cash, Willie Nelson and Gillian Welch. The Souvenirs were joined in the studio by a troupe of stellar musicians that included current bandmates and past collaborators: Dylan Schorer (guitar, pedal steel, lap steel, banjo), Dan Buehner (guitar), Brian Thurber (drums, percussion), Mark Smith (mandolin, guitar), Tyler Lambourne (upright bass) and Ryan Shupe (fiddle), as well as Tanner (piano, accordion, banjo, percussion), who produced I Ain't Happy Yet along with Henderson. The chemistry among the group made for six effortless days spent in the studio, where The Souvenirs recorded I Ain't Happy Yet and also contributed to Tanner's Together Is Where We Belong. "We just didn't want to, like, overthink it too much," Bradshaw says. "We wanted to just trust everybody that was involved. They were invited because they were going to bring something special to the recording process. ... It was really, 'Let's get all the right people, and then the right album will just happen. And let's just get in the room together, and let's get in a circle and record this thing live and just trust each other.'" Country/gospel album I Ain't Happy Yet is a mix of new tunes ("Paper Bag") and old Folka Dots songs ("Black Crow"), as well as a few classic covers ("Ring of Fire"). While "our songs have grown with us," Bradshaw says, the trio's songwriting is still as heart-pricking as ever, with an unflinchingly honest view of love, faith, family and—especially on the new album—life's many disappointments, bad luck, hard times and seasons of discontentment. And The Souvenirs now have a moniker that more accurately represents their music and its often-weighty subject matter, as well as their aesthetic. It also helped bring about the rich, full sound of the album itself. "The other people involved with making this record, from the producer to the players, had a huge role in the way that [I Ain't Happy Yet] turned out," Bradshaw says. "It's probably safe to say we would have never gotten to the point where all these amazing musicians would have been able to step in and help us as The Folka Dots."